i met chef domenica macchia in september. i had spent the day handing out flyers in ybor city trying to get people to vote for me in -- well, you know what i was trying to get them to vote for me in. anyway, afterward, i felt like going someplace cool for dinner, and my pal laura reiley had been telling me about a place she was about to give 4-stars to for their food. laura is paid to know these things, so i was immediately interested. and it wasn't far from my house. so pam and i went, and had a great dinner. at the end of the dinner, we gave our waitress a stack of the cards and asked her to ask her friends and the staff to vote for me. Ten seconds later, the chef was bee-lining out of the kitchen to come talk to me. she said it sounded awesome and she would vote for me. awhile later, when i was celebrating the results of the contest, i gathered up a crew to celebrate, and we went back to the place, which i won't bother to mention, but you can read about the dinner from that first night here if you want. anyway, she treated us very well that night, and on a subsequent visit, which was her last night there as it turns out. the world being what it is today, it has taken her awhile to get a kitchen again, but short-happy version is, she does now, and you can go on tuesday when they open. but i got to go friday, when they weren't open. dom wanted people to try some of the things she put on the menu, to make sure they "worked." so pam and i went, and for additional opinions, i brought along the people i am just going to start calling my taste buds (unless they think that is weird and don't want me to), becky and jeremy. it seems like every time i have a decent meal lately, they are there. warm olives and almonds: a huge bowl of 3-4 different kinds of olives and toasted almonds, with lemon zest and sea salt. grilled skirt steak: this was fantastic. i loved the marinade and started guessing what was in it. i got a few key ones. i'm a big fan of skirt steak, so this was a fave. the burger: it was a gargantuan patty, topped with dom's bacon-onion jam. i love the idea of chopping up the bacon and putting it in the caramelized onion. that way the strip doesn't pull out when you bite, leaving you with no bacon the rest of the burger. and she said she likes to cook the onion instead of just adding raw onion to the plate because "i'm a cook. i should cook it." argue with that. the grilled cheddar: it was really good cheddar. she explained that it was six-month cheddar because if it was older, it wouldn't melt as well and would be grainy. i had no idea, but it makes sense. there were thin slices of granny smith apple on there, too, which added a nice crunch and acidity. turns out the menu says there is bacon, too. dom said she forgot that and thought this was one of her vegetarian dishes. whoops. it will be optional starting tuesday. also, we thought that it could use more apple. we're tough, tho. 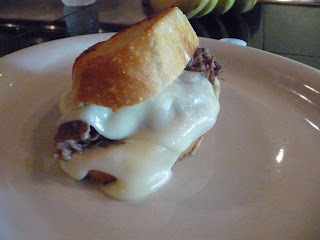 the shredded short rib sandwich: the short ribs were a big deal at the previous place, and paid homage to dom's training ground in nyc, daniel. if you don't know from daniel, i'll let alan go to town in the comments. suffice to say: we want to go there. there were really good and meaty. i have had short rib sanwiches that were too broken down, with no texture or bite. these had bite. they were on a delicious country white bread and enrobed in melted fontina. that was it for friday, but we were invited back saturday afternoon to work out the menu item that has had me excited for a couple of months now: the crushed deviled egg sandwich. i love egg salad. and i love deviled eggs. when dom was working on the menu, i noted that a lot of trendy menus have deviled eggs these days, some good, some meh. she said that she had the crushed deviled egg sandwich on her menu, and i couldn't wait to try. now, i liked it because it seemed like a playful name for egg salad. dom insists there are differences between egg salad and deviled eggs. i always thought the only difference was in how you cut the whites. no no no no no no no no no, she says. i believe her. so we tried three different dressings for the yolks. all were largely the same, but each had one major difference, none of which i will divulge. i will let you in on one secret, tho: after much diliberation, becky, jeremy and i chose B. actually, there wasn't all that much diliberation. 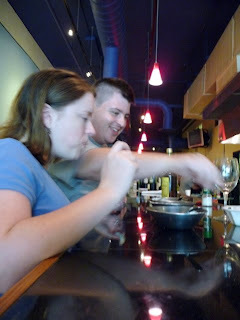 we also got to try two desserts on saturday: the rice pudding and the chocolate-banana bread pudding. both were fantastic. dom has been determined to get me cooking, and i think the photo at the top suggests why that may not be the greatest idea. i take up a lot of kitchen. chefs are mostly pretty small. i mean, some are portly-ish, but i'm gigantic-ish. so, dunno. it was fun, tho. hope you make it over there tuesday, because i hear there may be an interestingly named sandwich special. that's all i'm saying.